Everyday at my son's preschool the kiddos are given free time to do an activity of their choosing. Some times Quinn plays with the blocks, in the play kitchen and even with the trains. 80% of the time though he chooses to do some sort of craft! He likes to color, draw, paint, glue and everything in between! My house is covered in my little artist work. Like most moms I like to encourage the things he has passion for, I like to enrich them. When I found International Arrivals I just knew it was the perfect shop for us. They have all sorts of products to help with creativity in little ones. I was sent several products for review, these are only a few of the many they offer. Has everything you could need to write a fun letter to Santa! Holiday themed cards, paper and stickers. And there is even a candy cane pencil include. My boys had a blast writing their letters to Santa with this kit. They can't wait for Santa to get their Christmas letters this year. A complete set of poster paints for artsy fun. 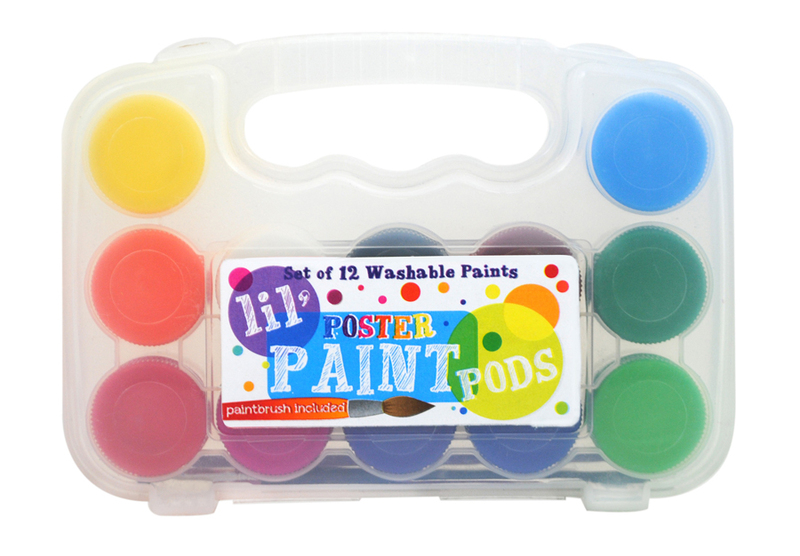 lil’ Poster Paint Pods come with 12 vibrant colored paints each stored in sturdy and reusable "paint pods". Included in the set is a paintbrush and a handy travel case; everything you need to make fun and colorful painted masterpieces. 'lil Poster Paint Pods are water soluble and will wash right out of fabrics too. WHOOT! As much as I like my little guys art I hate when it gets all over his clothing. It can be such a pain trying to get it out especially red. The fact this comes out instantly in the wash gets a huge thumbs up from this mama. The most "Appeeling" crayons you'll find. 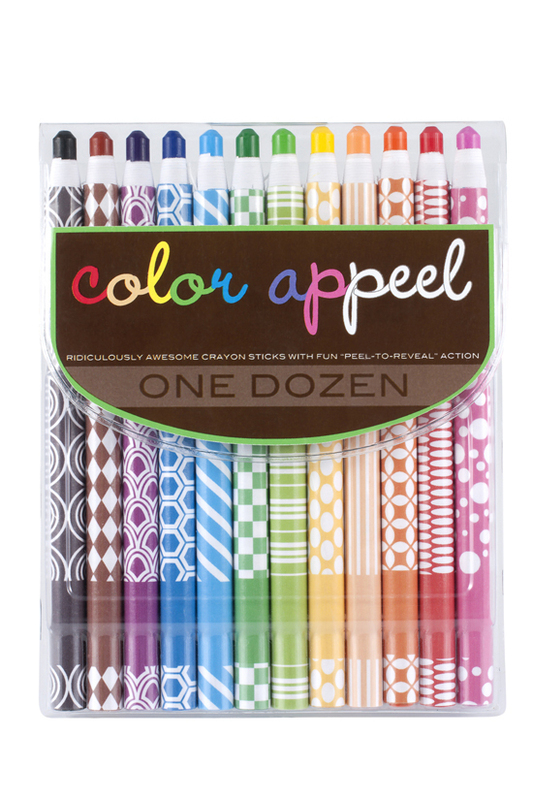 Color Appeel crayons are made with high quality wax giving you a strong crayon that lays down bright and smooth colors. 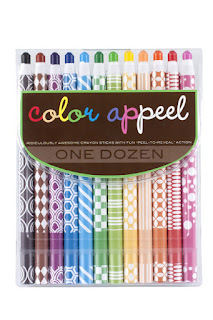 Color Appeel comes in 12 bold colors with unique patterned barrels. And when the crayon starts to wear down, just simply pull the string to peel away the paper for more crayon coloring fun. 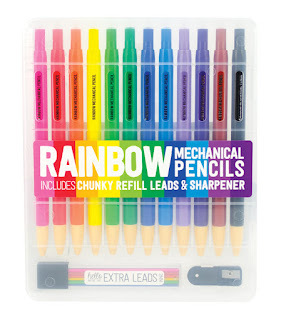 When you put mechanical pencils and colored pencils together, you get Rainbow Mechanical Colored Pencils. This set of colored mechanical pencils is everything you need for a colorful pencil experience with 12 colors in all. 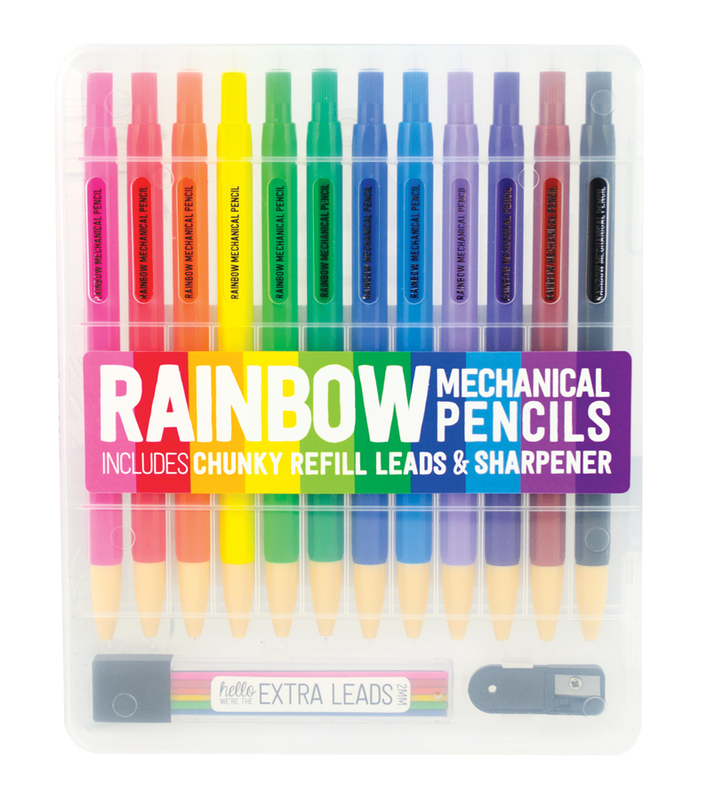 Rainbow Mechanical Pencils aren’t your typical mechanical pencils however; they have very thick colored leads; 2mm in fact, so you won't have any problems with lead breakage. Plus, since the leads are so thick they can be sharpened to. See the included pencil sharpener in the set. Say “no” to boring office notepads and say “Hurray!” to Padworks Animals! These cute creatures will be your best writing buddies. 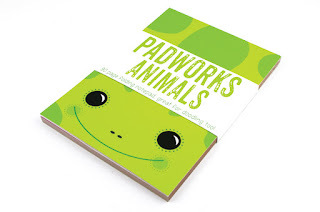 Padworks Animals features 8 different, colorful animal pages that make writing, note-taking and doodling fun. Meet Rabbit, Pig, Cow, Frog, Cat, Dog, Bear and Bird as your new partners in penmanship. This Padworks notepad has a thick cardboard backing so there’s no need to write at a desk or table; and Padworks has an easy folding cover so your notepad won’t close when you don’t want it to. If you are like me and have a little artist at home you so need to check out International Arrivals! 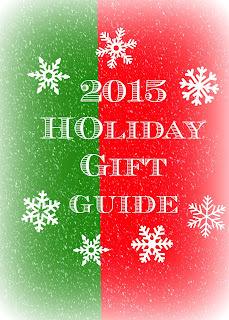 They have everything you need to keep them busy and to make their next great masterpiece!